Every dog has his day, and Duane "Dog" Chapman's was May 20, when he dressed all in white for his wedding to longtime partner Beth Smith. 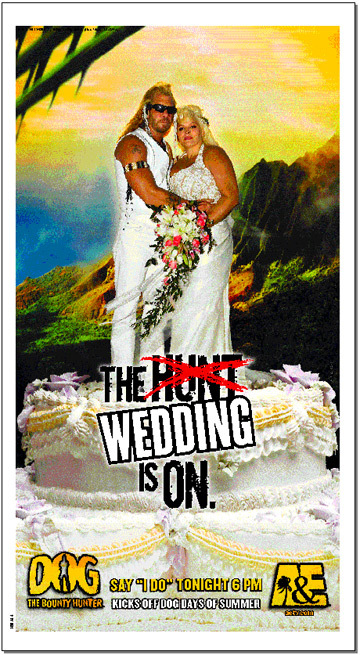 A&E airs a two-hour episode of "Dog the Bounty Hunter" devoted to the wedding at 6 tonight, repeating at 10. The show is divided in two parts. The first, "Bonds of Love," follows the wedding preparations, mixed in with the hunt for a bail-jumper named Brice. Part 2, "To Love and to Cherish," takes the couple to the Big Island's Hilton Waikoloa Village for the ceremony. The Hawaii-based reality show is the network's top-rated show, with 4 million viewers each week. A full-page ad appeared in today's Star-Bulletin touting the anticipated episode.